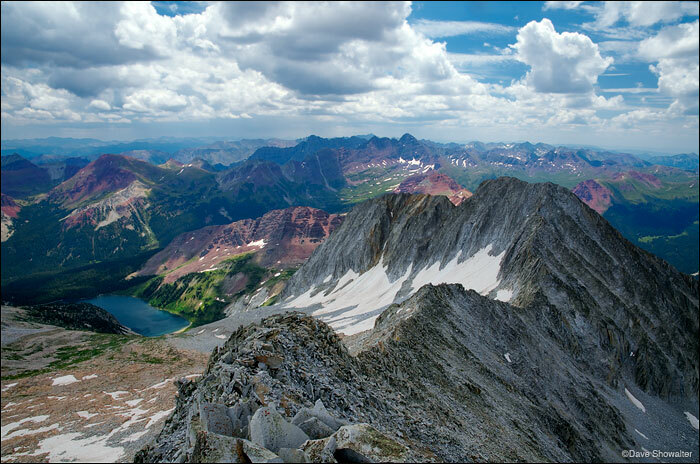 Snowmass Mountain (14,092') offers a commanding view of the high peaks of the Elk Mountain Range. Most of our climbing route from Snowmass Lake is in view, as well as Maroon Peak, North Maroon Peak, Pyramid Peak, Castle Peak, and countless others. There are mountains of our dreams that may never be reached and mountains of the mind that we just might stand on. Every one has its own special place etched into the soul. That’s the thing about mountains, they wait until we’re ready. Snowmass Mountain, in Colorado’s Elk Mountain Range, took us nine years to climb, a “not quite” in our Jerry Roach book. We first attempted Snowmass while circumnavigating the Maroon Bells on the four pass loop in 2003 and were thwarted by weather and a shortage of peanut butter and jelly sandwiches. True story. This time around, fitness was in question, but we were determined and had been perfecting the art of suffering over the last decade. The latter, combined with determination driven by a “not quite” in the Roach book, and lots of peanut butter on Marla’s homemade banana bread got us to the top this time around. The eastern slopes route is class 3 and almost all scree and talus after bashing through willows around Snowmass Lake. About halfway up the infamously nasty scree field, Marla gazes to Snowmass Peak, which appears taller than Snowmass Mountain from Snowmass Lake. Once you gain the connecting ridge, the remainder of the climb is on class 3 talus all the way to the summit. Almost there! Marla ascends on talus near the summit. Geneva Lake is the blue orb below. Snowmass is our 40th 14er, all of them together. I couldn’t dream of a better climbing partner! The official USGS summit marker. Posted in Colorado Mountains on July 17, 2012 July 17, 2012 by Dave Showalter. 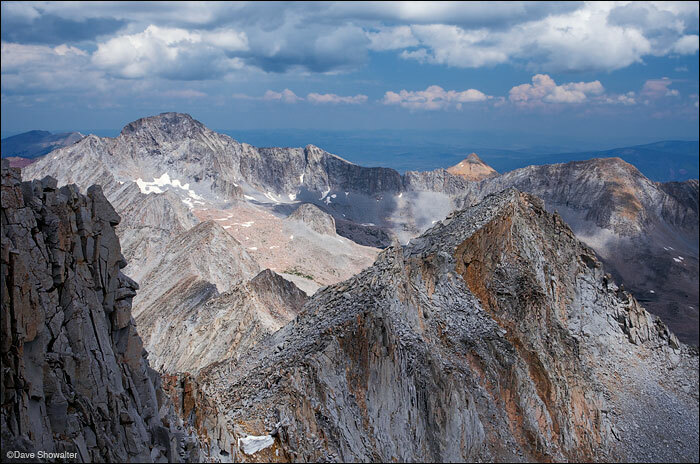 ← Previous: "“Bioblitz” With Audubon Rockies"
What a great recap of our 12-hour climb together! I couldn’t ask for a better backpack trip, a better weather day, a better climbing partner and husband AND photog! How lucky can a guy be? For us to still be chasing the dreams of our youth together is about as good as it gets. You’re the best! I got tired and winded just reading this post and looking at your images. Pretty sure this older guy could not keep up with you or your partner. Loved this post and congratulations on the 40th! Hey Monte, I take nothing for granted and it’s more exhilarating than ever to stand in the sky! Awesome job, you two!!! Great pics, Dave. You KNOW I’ll want to see some of these at a later date. Thanks Cloudman! We have no idea if we’ll climb ’em all, but each one holds something special… including a magnetic pull. Hi Guys…thanks for sharing your adventure. Very Impressive!!!!!! It would take many p&j sandwiches for me…love it. Dave, your commentary is wonderful as well as the beautiful photos. What a great partners you both have. Thank you, Eva. Yep, we’ve got a good thing goin’ and hope to make a few more before we see you and Johny T… soon! Congrats on the big 4-0. Looking forward to a hike of a slightly less strenuous nature with you two in a couple of months. Start making the peanut butter and jelly sandwiches! We’ll have some cool stuff cooked up for you two, and know that you’re up for anything. The crunchy, hippie, organic peanut butter will be ready too. Crunchy peanut better? I’m in! Congratulations you two! Wonderful images and commentary. I am very jealous. WOW! Congratulations on the BIG 40 you two! What an amazing& beautiful adventure. Thanks so much for the great photos & commentary. Thanks CK! You were along for a couple of ’em, including the burly Black Cloud route on Elbert! Congrats Dave and Marla! Sweet adventure shots in this post. What’s with that awesome reflection shot being used as a lowly route description? 🙂 Let’s see the artsy version! Thanks Mountain Photographer! I thought the black and white with a red line was really stepping out creatively. 🙂 But you know, the reflection was nice, the light very flat, so I dunno what I’ll do with that shot – I still don’t have the one I want from the lake. I guess we’ll have to go back. Fourty-something now, eh? Congratulations on each of them, especially Snowmass, that looks tough for sure. Looking forward to getting through some of the more interesting 14ers with you guys next year! Thanks Mike. We’ll get burly and strong for some big efforts in the future. One thing’s for certain, the mountains aren’t going anywhere, so it’s up to us. John and I were just saying how you paint pictures with your words as well as with your camera…love both. You are so talented…wish everyone could view this. Congrats on the 40th 14er! Finally reading/viewing this. Pretty dang awesome! Oh how I miss those mtns even though I love my lake in SC. I sure wish I would have climbed a 14er with you when living in CO. As always, beautiful writing and fantastic photography Dave, you capture it well. Miss you both! Thanks Judy! I appreciate your kind words and thoughts. We miss you here in Colorado and will look forward to you and Larry returning. In the meantime, knock off a few of those eastern mountains – the ones that still have their tops – and come back ready to hike!